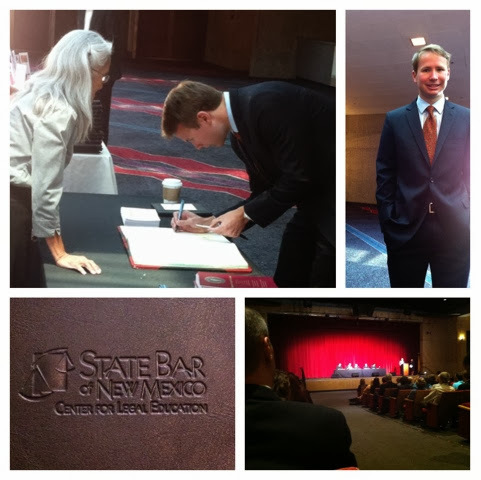 Today, my husband was officially sworn into the state bar and is now a licensed attorney! I am so incredibly happy for him and proud of his hard work. 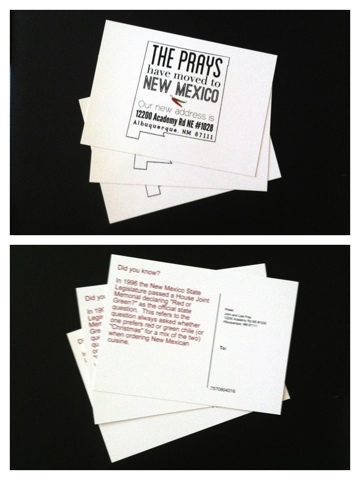 The swearing-in ceremony was held at a convention center and every new attorney was called by name and had an already licensed attorney motion for their acceptance to the state bar in front of the New Mexico Supreme Court Justices. John, and three other newly hired attorneys from his firm, were all motioned by their firm's practice group leader. They were one of the first groups called, which made sitting through all the other attorneys feel lengthy, but after all of John's hard work, the pomp and circumstance was rightfully deserved (and enjoyed). After the ceremony, we all went to lunch at a Brazilian steakhouse downtown. It was very yummy, and the conversation was delightful. I will say, however, that I was out of conversation practice... I haven't used my brain for awhile and it took me awhile to process things - I am planning on starting Kumon to keep my brain sharp (just kidding... but it probably isn't a terrible idea). 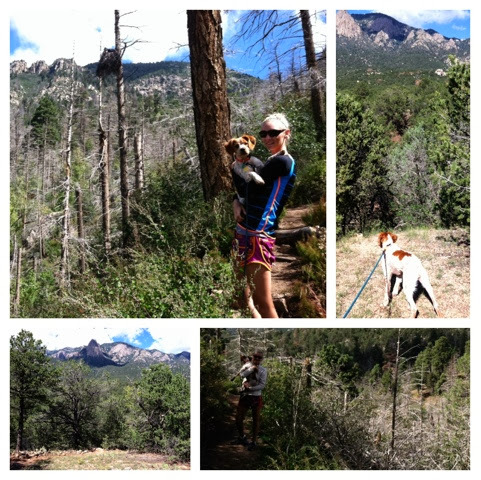 This past weekend, John, Scout and I hiked the Pino Trail. The trail is located right by our apartment, and it was little Scout's first legit hike. We were only planning on hiking for 3 hours or so (not the whole trail), but about 2 hours into the hike, we decided that we should probably just hike the whole thing so that we could check it off of our to-hike list. Although this sounded like a great idea at the time, the hike turned into 10 miles in the mid-day New Mexico sun. Since we were not planning on being gone for so long, we didn't pack sunscreen, ran out of water, and didn't have anything to eat (for us or the little pooch). Poor Scout had about 30 little cactus prickers stuck in her paw and cried every time we pulled one out (it was such a sad puppy we had)... but other than this, she was a champion! Had the hike ended 2 hours earlier, we would have really enjoyed ourselves, but this is a classic example of sometimes too much of a good thing is a bad thing. Lessons learned include, plan what you're going to do, and do what you plan... otherwise you will end up (very) hungry, out of water and sunburned. Yesterday, John and I ventured over to McCall's Pumpkin Patch to do some fall celebrating, and it was great fun. 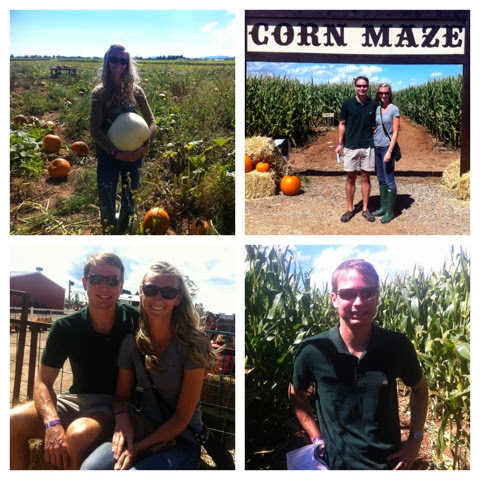 There were several great corn mazes, animals, and fall foods... everything a girl could want! We then took a hay ride to the pumpkin patch and went through a tiny portion of the massively large pumpkin patch - I'm talkin' huge. We picked four pumpkins in a variety of colors; had we had more time, I could have spent several hours in the pumpkin patch finding the best ones. 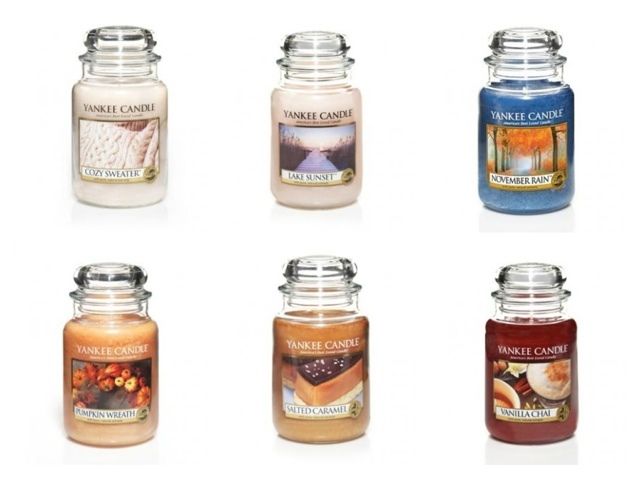 However, there was one, very important element missing... apple cider! It was oh-so sad that there was no cider. There is a cider festival in October, and God knows I will be going a bit cray-cray when I get my hands on some!! I can drink gallons and still want more. :) Feel free to judge, I am unashamed of my apple cider addiction! Cold, hot, with a splash of rum... it is all tasty to me! 1. Begin by washing and drying your glassware. 2. 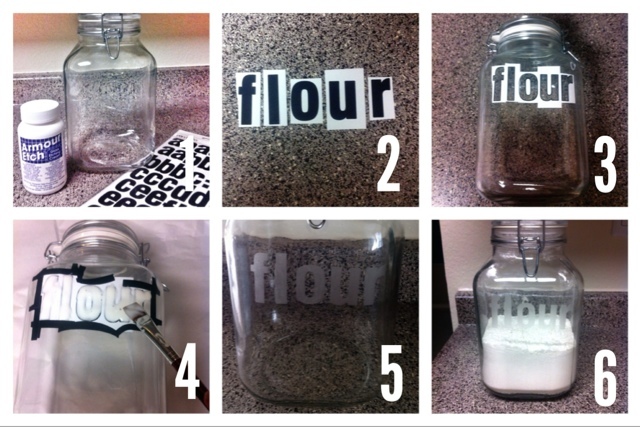 Next, lay out your stencil how you would like it to appear on the glass. Since I used letter stickers, I cut out the letters and used the outlines for my stencil. 3. Apply the stencil to the glass. Make sure there are no air bubbles (otherwise the etching cream may bleed under your stencil). 4. Dab on a thick layer of etching cream. Take your time and be careful to avoid drips. 5. Let your etching cream sit for 30 minutes (or follow the instructions on your etching cream bottle). 6. 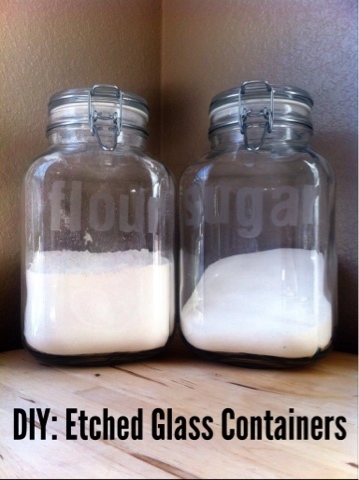 After 30 minutes or so, rinse off the etching cream, remove the stencil, and dry your glass. The etched glass doesn't show up in pictures super well, but in person it looks great! Scout has this new terrible habit of dumping all of the water out of her water bowl and onto the floor. She typically starts by drinking the water, which then leads to shoveling out as much as she can, and then she ends by trying to tip the water bowl over by picking it up with her mouth. We are unsure why she enjoys playing in her water so much, but John and I don't like cleaning it up (or stepping in it...)! 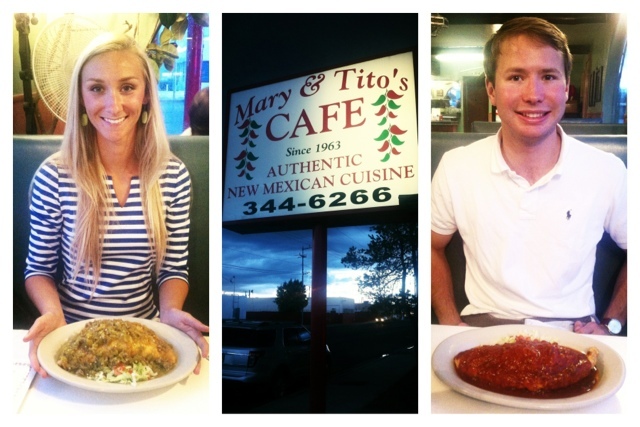 Yesterday John and I went to dinner at the most hole-in-the-wall New Mexican restaurant... it is the hole-in-the-wall. I'm talkin', you're over dressed if you're wearing shoes, kind of place (actually, they probably require you to wear shoes, but you get my point). ANYWAY, this place had incredible food. In fact, it was a James Beard American Classic award winner in 2010! Check out the movie below... super fun story! I ordered the chicken, beans and cheese turnover (which is basically a stuffed sopapilla) with green chili, and John had the carne adovada turnover with red chili. 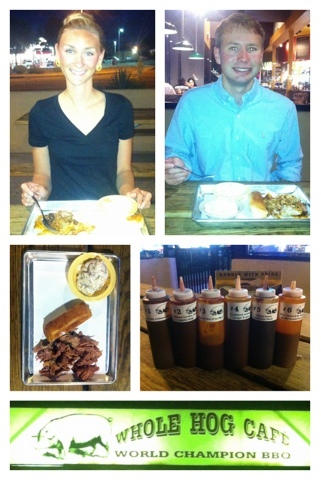 We had a ton a food, but needless to say, my sweet John polished off our plates for us. Aww, yeahh! My incredibly smart, hard working, and handsome husband found out that he passed the New Mexico bar exam today! Scout, Winnie, Shadow and I love you and are so proud!! It's a very good thing you passed because Scout got into your box of law school books this morning and chewed some "Criminal Law and its Processes" (talk about an expensive dog chew...). ...don't worry, I quickly stopped her, and I should be able to tape it. 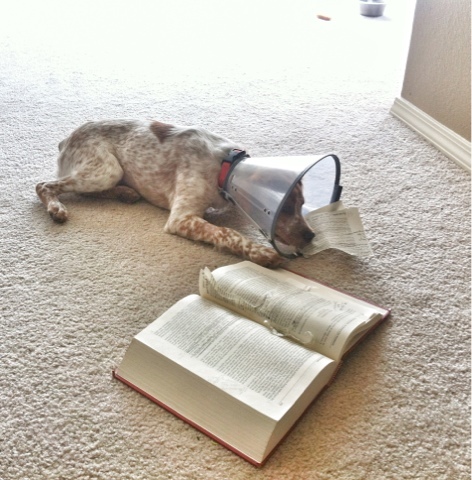 And with the cone on her head, she didn't do too much damage. Considering your current position, I figured Crim Law would be the least useful for you anyway. 1. First, cut the plywood to fit the size of your shadow box (I had this done at Home Depot). 2. Next, center the outline of your state onto the plywood and start to nail around the border of the shape (I found that it was easiest to hold the nails with pliers while hammering since the nails are so small). 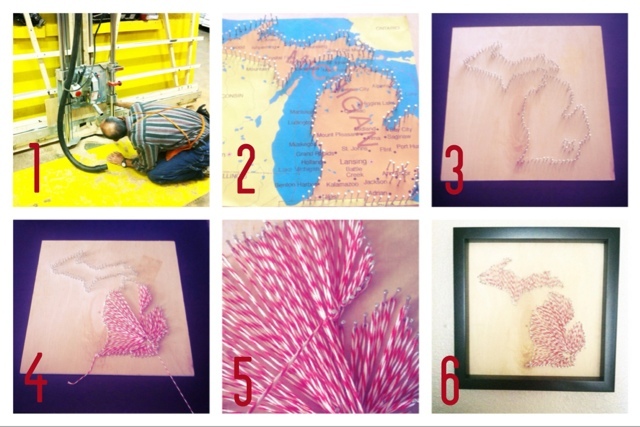 After the outline shape is complete, hammer a heart around the desired location within your state (I chose Ann Arbor). 3. Once all of the nails are in place, gently remove the paper outline (take care not to pull the nails out). 4. Then, start stringing between the nails; start by tying a small knot around one of the nails on the border (choose any border nail). Pull the string from the starting nail to the closet nail used in the heart shape; wrap the string around the heart nail and then wrap around the border nail next to where the knot is tied. 5. Keep doing this until all of the nails have string going through them; make sure to space the string around the center heart as evenly as you can. Also, if for some reason a border nail cannot reach a center heart nail, loop the string around the closet nail going in that direction (as if it were going to go to the center). 6. Finish by tying a knot around the final nail (I helped secure the knot with clear nail polish). 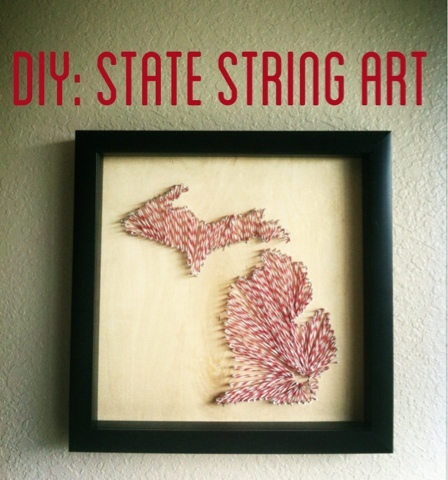 Place the plywood in your shadow box, and enjoy! 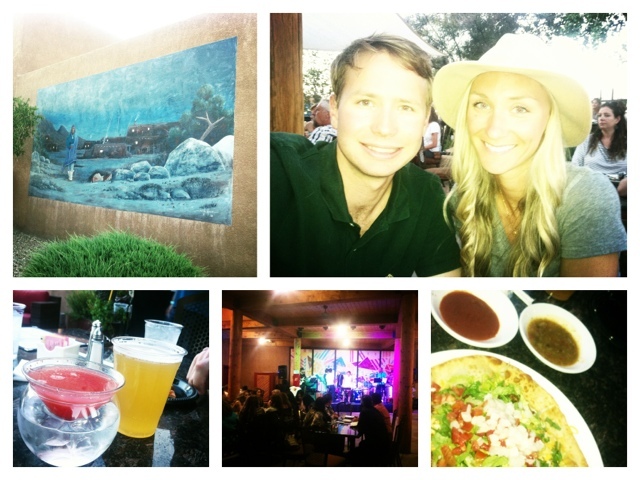 After only two nights in New Mexico, John and I left for an adventure in southern Colorado (trying to get in some fun before John had to start work!). 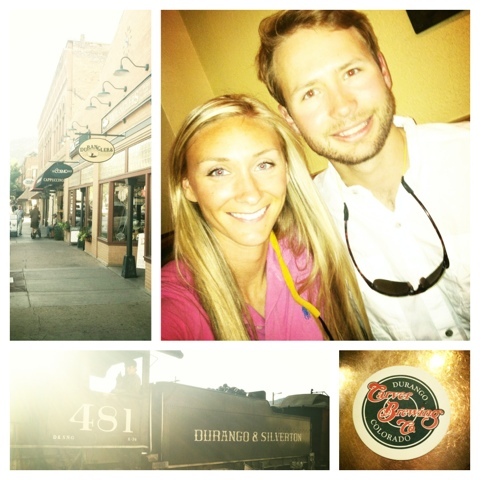 We explored Durango, Silverton, Ouray, and Telluride - and we had a great little taste of each town. Durango was fun, but unless you are hiking (or doing some other outdoor activity) or riding the train to Silverton, there isn't a whole lot to see. We spent the day downtown (doing some shopping and dining), and we were able to cover everything we wanted to see fairly easily. From Durango we headed to Silverton. We weren't planning on staying the night in Silverton, but due to 3 different mudslides on the way to Ouray, the road (Red Mountain Pass) was closed, and we were forced to stay the night. This unexpected night's stay turned out to be a ton of fun! We stayed at a lovely bed and breakfast and went to dinner at a fun place called Montanya, which distills their own rum. The clientele consisted of maybe 15 people... all of whom clearly knew each other - they must have been guides for fly fishing, rafting or something like that. 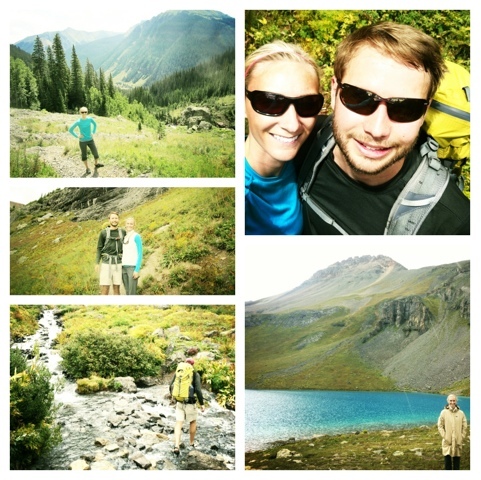 After our night's stay in Silverton, we hiked the Ice Lake trail in the Rockies... it was incredible. I had never done "real" hiking before, and it was the perfect first hike. It was considered a "moderate - strenuous" hike according to our guidebook, and I would say that is pretty accurate. The elevation increase was what made it difficult, not the trail itself per se. The next night we stayed in Ouray, and went to a fun brew pub for dinner (it seemed like there were a ton of breweries everywhere we went). 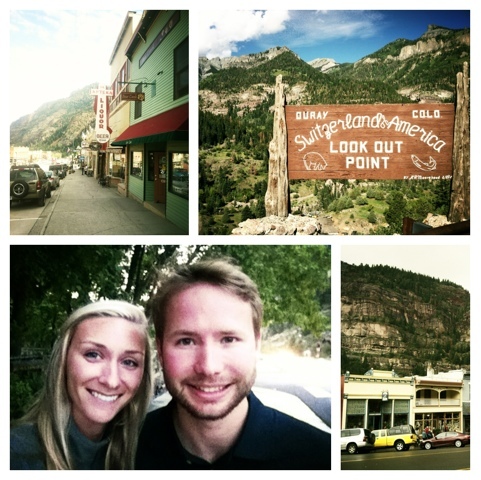 Ouray is a small town, surrounded by the Rockies on all sides - it was beautiful. No pictures that we took will do it justice. 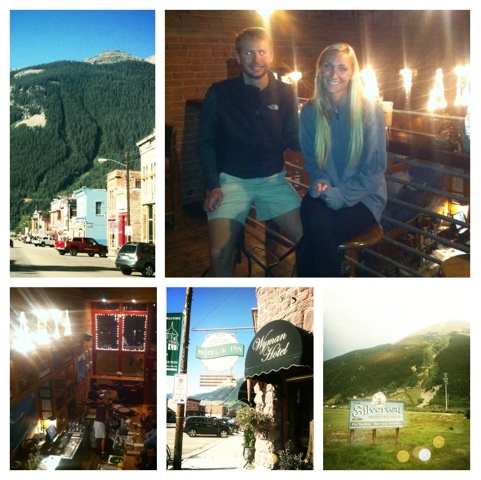 The last city that we visited was Telluride which was, by far, my favorite city. 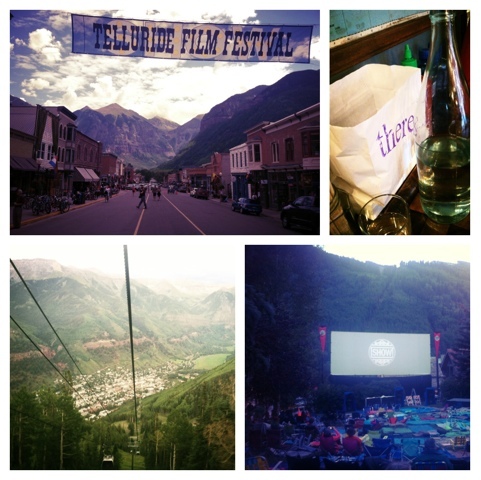 When we were there, the Telluride Film Festival was happening - Robert Redford and a few other celebrities were there (last year, George Clooney was in town... my only Hollywood crush!). So many cool shops and yummy restaurants. Telluride also has a gondola that takes you to the other side of the mountain. It makes for gorgeous views! 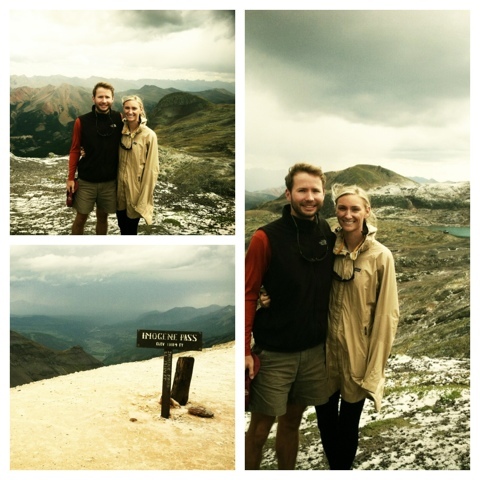 While in Telluride we also did a 4x4 tour of Imogene Pass. It was raining pretty hard on the way up the mountain, and even started to hail, but we were able to make it to the top for the incredible views. John and I are settling in quite nicely to our new home... I know how to get to Whole Foods, Chick-fil-A, PetSmart, and Starbucks, and for now, that's all I need! I spend a lot of time at Starbucks, actually... I buy a venti and feel entitled to at least two hours of free wifi (since we don't have internet set up yet). I do not yet feel up to braving the DMV to update my driver's license, and I am in no hurry - I will save that for a day when I am feeling more ambitious. 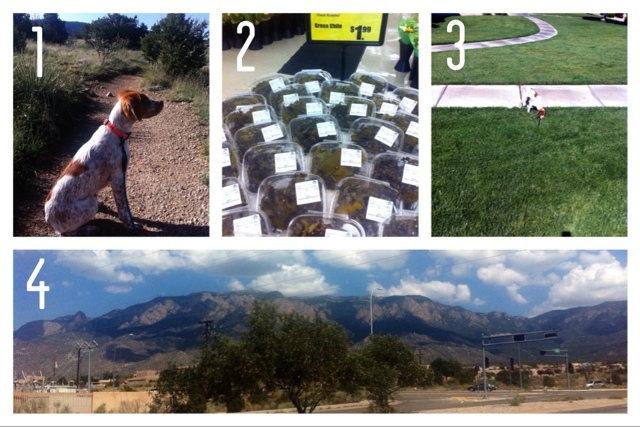 Below are a few pictures of our day-to-day. Since we are so close to the mountain, we are living at about 6,300 feet elevation (about 1,000 feet higher than the rest of Albuquerque - depending on the location). Running at this elevation is a fun challenge (but more than running, it is the stairs that get me!). Running is a pretty serious business here, and every morning there are flocks of people running. Like, super in shape people. I wonder if these people have jobs? ...it is 9 am... why aren't you working? I over heard a (very fit looking) woman say that she was running a 50K next weekend (50K, not 5K)... what??! Who does that??! 2) Green chiles (spelled "chile," not "chili" in New Mexico)are everywhere... You can get a green chile burger, green chile wine, green chile pizza, green chile (insert food here). It is the thing here. I will admit, they are yummy, but they make food all taste the same - so only one green chile (insert food here) for me a week. We haven't found any restaurants that we are googly-eyed over yet, but we have a few gems on our to-try list. 3) Where we live there is plenty of grass (which is meticulously maintained and watered 3-4 times a day). My Midwestern born puppy (and her Midwestern born mama) appreciate this. Since we have grass, we also have a fun assortment of critters running around outside. There are more hummingbirds than you can imagine, and just about every porch has a feeder, or two. I am convinced that these aren't actually hummingbirds, but that the nearby Air Force base is collecting data on civilian recognition of drones. You can't fool me, Mr. President. We have unpacked all of the essentials and have maybe five or so more boxes to unpack. I am fairly motivated to unpack these boxes because I have a "to buy" list that I will not let myself touch until we are completely unpacked. I am also looking forward to trashing all the cardboard boxes because Scout loves chewing them to pieces. 4) We have a beautiful view of the Sandia mountains from our apartment complex. It is quite wonderful, and I often feel like I am on a study abroad... it hasn't hit me yet that this is "home." "Sandia" is Spanish for watermelon (the mountains glow red at sunset). When we first arrived in New Mexico, I ran to the grocery store and saw that there was Sandia flavored Gatorade. Excited to sample the local fare, I bought a pack and brought it home for John to try. He lovingly pointed out that I was reading the Spanish label (English was only a 180 degree turn away) and that it was the same watermelon flavor we get in Michigan. I was slightly disappointed, but it still tasted yummy. Although we have only been in New Mexico for a total of 11 days (4 of which were spent in Colorado), so far it seems not too bad. I don't know if it will be a "forever home," but this whole dry heat thing is pretty cool. I have always sworn to love humidity, but it is incredible how enjoyable and livable the weather is here. In the mornings, the temperature is in the low 70s (and when I say morning, I don't mean 6 am... I am talking 10 am - so you have time to actually enjoy it!). During the day and into the evening it gets pretty hot, but it isn't even the temperature so much that is hot, it is the sun (if you are in the shade, it isn't bad...). We have been sleeping with our windows open, and it has been quite lovely! I will say, however, that every once-and-awhile I find myself with goose bumps (even though my phone says it is 87). Also, our apartment has a pretty great pool that we have used a few times, and unlike in Florida, when you get out of the water and you aren't cold, here, when you get out, it is cold (because there is no humidity)! So you have to dry off and heat up before you can feel warm again. 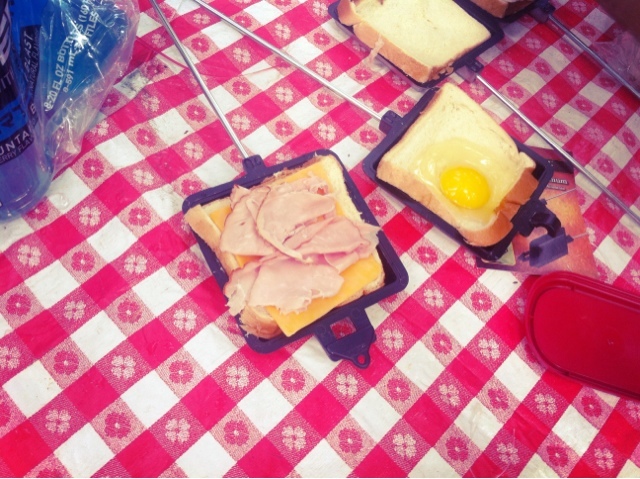 One of the great things about camping is all of the yummy food you can make! 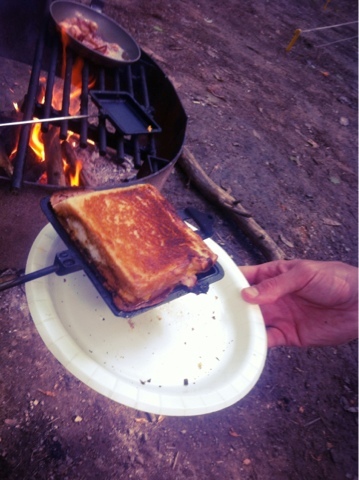 Below I posted a recipe on how to make a very easy, but tasty, campfire breakfast sandwich. To make this recipe, you will need a "camp cooker" (sometimes called a pie iron). Start by buttering two pieces a bread and placing the buttered side touching the pie iron. 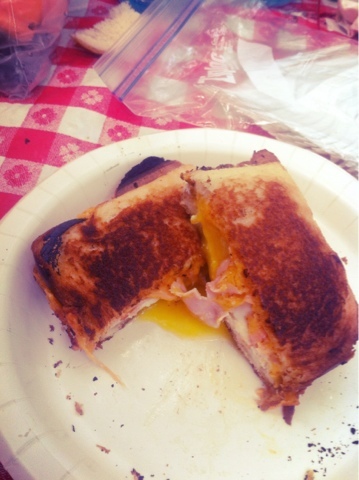 Next, crack an egg on one of the pieces of bread and cover with deli ham and a slice of cheese. 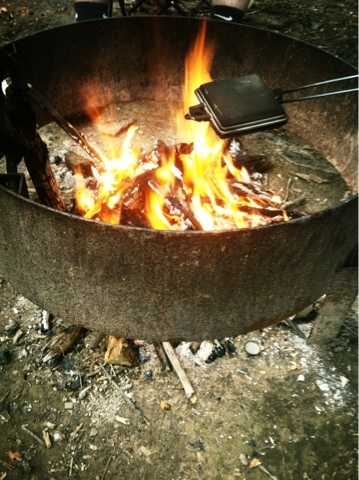 Then, close the iron and cook in the fire. Since it will take the egg whites time to cook, don't put the pie iron in the hottest part of the fire (or else the bread will toast too quickly and burn). Make sure to rotate the iron so both sides of the bread toast. Take a little peek in the iron every now and then to get the bread toasted to your liking. Once the bread is toasted, and the egg whites are cooked, you are ready to eat your yummy sandwich! I certainly love me some Tory Burch, but I don't always have $250 to drop on a new pair of flats. And the great news... you don't have to break the bank to buy a new pair of good looking shoes. 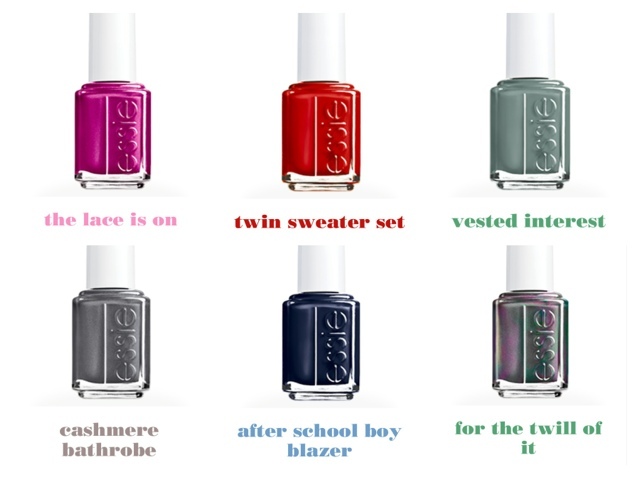 Below I posted some great flats that I pulled together, all under $40! 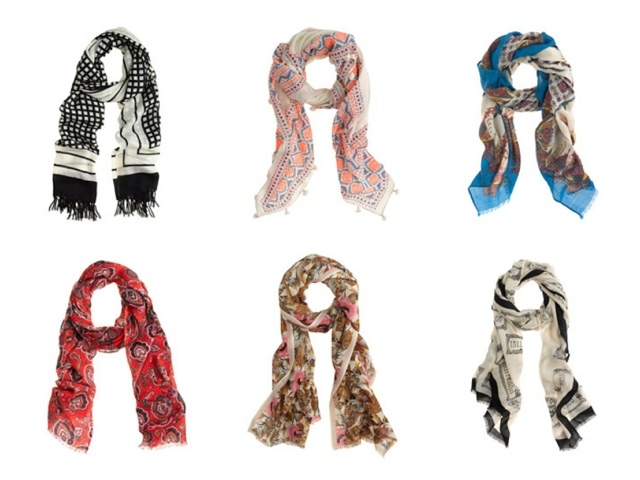 Target, Old Navy, Steve Madden, etc. all offer good looking shoes at affordable prices.